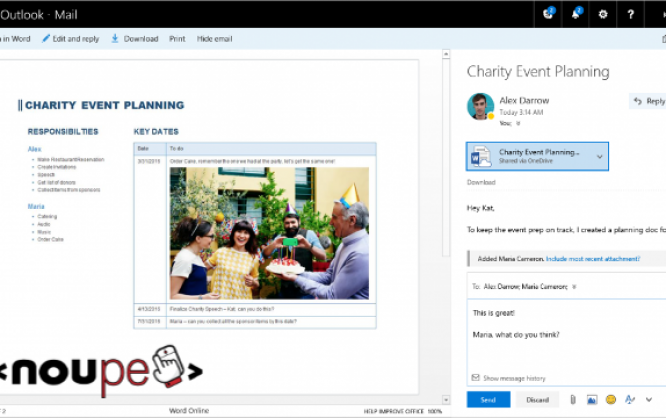 Outlook has recently undergone a big revamp, and has rolled out a whole new set of features for its web version. Keeping the growing market share of GMail in mind, Outlook’s new look seems to be an attempt to outsmart the competition. Among other things, Outlook now has a whole new design, plus a new set of emojis. You can “like” emails, and even tag people right within the email body. Outlook also comes with mediocre image-editing capabilities within your inbox — possibly as a reply to Google’s Drive integration in GMail. Plus, you also have Giphy integration in Outlook, so you can share and send GIFs with ease. An interesting feature that Outlook has added to email now is the introduction of social networking concepts in your inbox. You can “like” conversations as if they were Facebook posts — simply like the email in question, and you needn’t respond to it either. Similarly, you can use the @ sign to tag people in your email body — possibly to draw their attention towards a specific point that you are making. Outlook has already had integration with other Microsoft products, such as Office Online and Skype. Thus, you can still have document editing and video chatting facilities in Outlook, and this latest update focuses more on the email-centric aspect of things. Also, Outlook now has a new set of third-party addons, such as PayPal, Yelp, Uber and Wunderlist that you can incorporate in your workflow. Learn more about the new Outlook updates on this page. What do you think of these updates? Will you be using Outlook anytime soon, or you’d prefer sticking with GMail? Share your views in the comments below.